Our oceans worldwide are currently badly damaged and are being methodically annihilated by commercial fishing using bad practises, and government lethargy. This is a dire situation on a global scale involving the multibillion dollar fishing industry. The fishing industry plays a vital role in our wellbeing and directly or indirectly contributes to the livelihood for over 500 million people…it’s imperative that we get this problem gets solved! The main problem is that the trawlers equipment has the lack of ability to allow juvenile fish to escape from the net as it is being trawled. 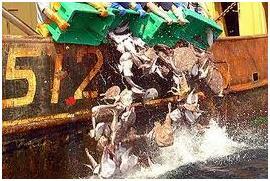 The newspaper The Sunday Star Times in New Zealand has estimated the total discard rate as being 280 million fish per year. 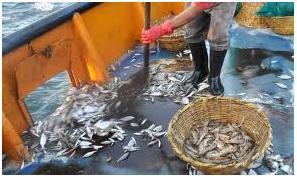 Discards are the smaller fish which are caught in the trawling nets due to not being able to escape. They are then thrown back in the ocean, most of them being dead, thus depleting the oceans of their future breeding fish stock dramatically. The Sunday Star Times says “Industry sources say research points to around 200 inshore trawlers dumping around 4000 fish every trip for 35 trips a year- 280 million discards”. That’s just in New Zealand! Though this may be disputed by some, there is no doubt that some urgent action needs to be taken globally. The New Zealand government is among others who feel the solution to prevent discarding is to charge a fee (deem value) for catches over the businesses quota. These quotas are monitored by Catch Data which is a requirement of the Fisheries Act that asks Skippers to present all catch taken on board back onshore, regardless of their sale value. However all catch is not saleable. Why would a skipper want to pay a fee for fish they cannot sell? Instead they are choosing to avoid the fee and are dumping unusable fish and other unsalable species back into the ocean dead. These fish are not being accounted for and presumably there are 280 million of them per year from one country. Here is a different example. Not long ago Trevally was caught over quota by 76%! So the Skippers paid the fee and then raised the value of the fish. So who paid the fee really? But it doesn’t stop there. The government didn’t deduct that 76% off the quota for the next year! Everyone’s quota started from nil. Oh, and if they under-catch the quota it gets ADDED to their quota for the next year! The governments of Europe, some fisheries of the United States of America, Canada and certain fisheries in Australia are now at least recognising this problem, although how urgently they are acting on it is another issue. European governments are agreeing to ban all discarding by 2019 and wanting to introduce gear technology. Some governments do not feel this is relevant at all at the moment- New Zealand being one of them. Gear technology is one major part in solving this problem. The gear technology is different for each fish that is being trawled for. As each species have varying shapes, sizes and weights, change of equipment is necessary for a productive catch. For far too long the nets used while trawling have not allowed the smaller and juvenile fish to escape. So they end up on deck, and most of them die before being dumped back into the ocean. Recently I had the wonderful opportunity to meet Rick Burch and Oliver Wade. Oliver is a British Fisheries Scientist, and Rick is a commercial fisherman who has developed the gear technology needed to allow juvenile and small fish to escape the net and thereby providing a means to begin to solve some of the problems. With a little bit of help from us all Rick and Oliver can help make some major changes to the state of our ocean life. Both Rick and Oliver are passionate about the ocean, and have put years of time into aiding the fishing industry to be more ecologically and environmentally friendly. This whole process has proven to be very frustrating for both of them, as every person they have talked to within the government has made empty promises or nonsensical excuses and then closed the door. Rick has had the experience as a commercial fisherman in all areas of the world and in the Hawkes Bay area of New Zealand, for over 30 years. Oliver works locally and has been voluntarily helping with the scientific information needed for the development of a square mesh trawling net, which Rick believes could also be used on purse seines (purse seine nets catch schooling fish like tuna by en­circling the school with a wall of netting). The net is made of a lighter weight material and uses square mesh instead of diamond. This allows for a much larger amount of small fish to escape. As the whole net weight is less it has a minimal effect on the seabed compared to regular nets, and there is also the benefit of around 30% reduction in fuel consumption. In 2011 Rick and Oliver received funding to carry out a trial on the effectiveness of the net. Trials were conducted from 29th May and the 15th June 2011 and by July 2011 Oliver had completed writing the results. You can find them here…. For an unknown reason the report written by Oliver was not released by the people who funded the trial. Then early this year it was anonymously sent it to a reporter and was published in the Sunday Star Times January 2013. There has been little response to both the article and the release of the test results despite the results speaking for themselves. I really look forward to seeing this net being used widely around the world and reading the statistics of fish stock as they improve over the years. So what else are we going to do about this? It’s up to us now folks! It’s not time to sit on the couch thinking someone else will do it. If you don’t like something that is going on around you, stand up and be heard. You are a vitally important part of this change! If these two men had not put all their time and passion into this we would not have the opportunity now to use their creation and information to help replenish the oceans that belong to all of us. We all can and need to be a part of fixing the world! Thank you Rick and Oliver! 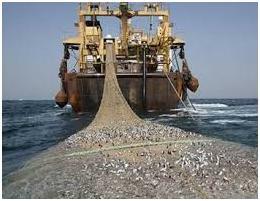 In addition to the above, trawling destroys the sea floor ecosystem, worse than clear felling a rainforest.